I didn't' realise till I got an email from my dear friend Sunny that I hadn't posted for 10 days.. It's been really busy what with working on finishing a quilt , a trip to Perth for my GD's 18th and also birthdays here..As well as the usual morning dips, housework etc ..
That is SEW cute! Glad to hear all is well in your part of the world. I thought you might have melted away. Isn't it amazing how quickly the time goes? I love your dino project. oh well done, start to finish in record time and it's gorgeous.... The time is already disappearing from us! The dinos are lovely and the bright colours of the quilt will cheer up the recipient every day! Very cute dinosaurs. Lovely finished quilt! those dinos make me smile! The dinosaur quilt is adorable. My favorite is the dino in the egg. So sweet. This finished so cute. Thanks for the online suggestion, I found everything but a cute flying one. your is so simple and just as cute as the others. I'll just draw one from yours is that is okay. I'll link back when it's done. I don't know if you will get a notification or not, we will see. The dinosaurs came together so quickly! And aren't they cute!! Hope your enjoying your daily swims. Happy new year! The dinosaurs are so cute.....life gets in the way of blogging sometimes. The quilt turned out so well. I'm sure the new owner will love it. Very cute dinosaurs, very hard to get to the blogging sometimes. 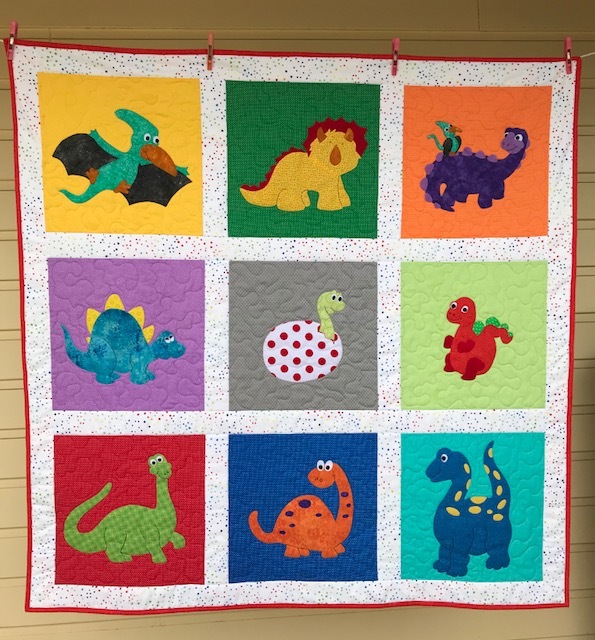 Such a gorgeous quilt, all kids love dinosaurs! WOW! so bright and so cute! It looks fabulous. I’m sure it will be loved.